This is the 42nd time I’ve celebrated Valentines Day with you. You were barely, if, a man when we exchanged tentative kisses that first year. I most certainly was not a woman yet…. just a young teenage girl. But you swept me off my feet. You seemed to know what you were looking for in a soul mate. You never wavered — not once — such confidence. It wasn’t the normal “hot-shot-ego” kind of swagger of a teenage boy. Just a steady increasing tenderness and love for me. How could a girl resist being pursued in such a way? I didn’t mirror your certainty in the beginning. I was smitten, don’t get me wrong, but I don’t think I saw beyond Friday night’s basketball game. I was anything but confident as a middle-child 15-year old. I wasn’t shy, but I was distrustful and hesitant. I was waiting for you to get to know me better — and then drop me. But you never did. You got even more persistent. I still have the little plastic statue you bought for me in 1972. He’s kinda funny looking, really, but those little gray statues of big-eyed, droopy-clothed people proclaiming a variety of things were popular and trendy those days. I remember my closest girlfriend asking what you got me for Valentine’s Day. We were on a double date, I think. 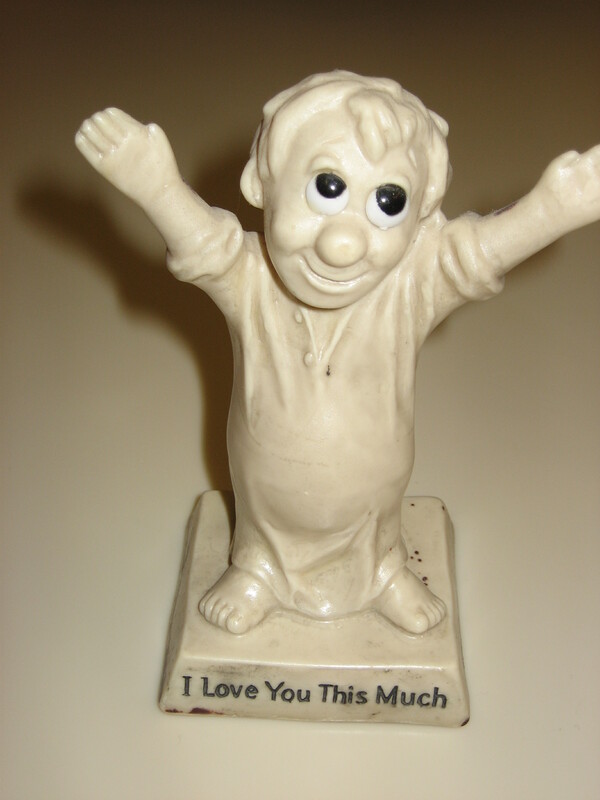 I replied, ‘he got me this little statue that says, I Love You This Much’, and I spread my arms open about as wide as my shoulders. And you said, ‘No, he is saying, I Love You This Much, and you spread your arms out as far as they would go. I think that is when I knew you were here to stay. My friend was now smitten too. I think if I’d let you go, she might have been there to catch you. But I never did. I rather enjoyed the pursuit. I told you this recently, but I remember hearing the Wedding March music begin on our wedding day. As my bridesmaids began the trek upstairs, I panicked and looked toward the back door. Thoughts screamed in my head, ‘what am I doing? I don’t know what love is. I’m only 18!’ Funny how I remember that so clearly. But as I went up those stairs, other thoughts won out, ‘He loves me so much. He’s good to me. He takes care of me. He’s a strong, godly man’. When I reached the back of the sanctuary, there you were at the end of the aisle, tears running down your cheeks. Thankfully, I knew they were tears of happiness, or I might have still taken my leave. I knew you were thinking of me when you shoveled the driveway and salted the ice on the steps. I saw your love when you filled my car up with gas and changed the oil. As we raced to the emergency room, knowing we would never hold that baby this side of heaven, I felt your love. When you saw my agony after knee surgery, and pampered me and made sure I got comfortable… that was love. After accident number six, you still asked if everyone was ok before you asked about the car. The simple call from work asking if I need anything picked up on your way home. Even on the days when we are both so bone-tired, we barely acknowledge the presence of each other, love is there. Solid. Strong. Unwavering. A Promise. Forever. This is what love looks like… the day-to-day, nitty-gritty stuff. Hanging in there on the days I madly love you and hanging in there on the days I look at you and think, ‘who are you, and why are you in my house?’ What a difference 42 years has on one’s perspective of love. Yes, love is the pursuit, and I still want to be wanted — absolutely. But better yet, stand by my side through better or worse, for richer for poorer, through sickness and through health. Those were our vows… the covenant we made with one another. That covenant still holds… I love you. Oh, my goodness, Connie. I’m a puddle of tears. Such a beautiful tribute to your man. I love you both!